This is a delicious combination, and lemon gives it a bright tang. Make the quinoa: Bring 2 cups water to a boil in a medium saucepan. Add the quinoa, reduce the heat to low, cover, and cook without stirring, 15 to 20 minutes, or until the water is absorbed. Make the chard: Meanwhile, in a large pan, combine the chard with ⅓ cup water and ¼ tsp. salt. Cover, bring to a boil, reduce the heat, and cook 4 minutes, or until the chard is tender. Make the tahini sauce: Put the tahini in a small bowl. Stir in the lemon juice, garlic, and remaining ¼ tsp. salt. Gradually stir in 2 to 3 Tbsp. water to yield a sauce that's creamy but not runny. Serve the dish: Divide the quinoa into 4 mounds on individual plates. 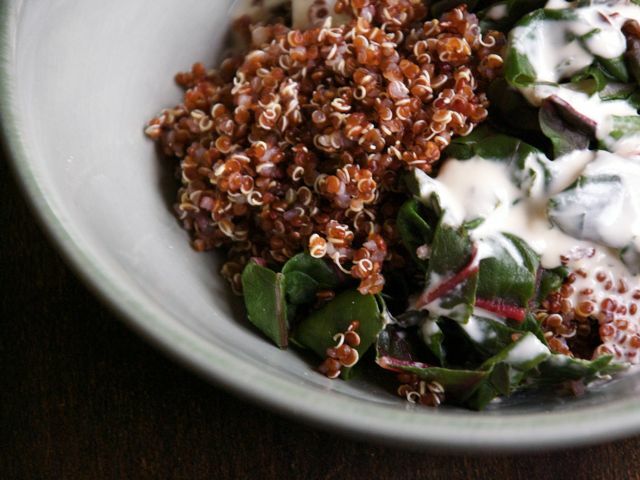 Using tongs, arrange the hot chard over the quinoa, then top with the tahini sauce.